Hello biochar fans. Here are the top stories we found this week in the world of biochar. The Discovery News website just ran a feature discussing how a specially engineered blanket can convert plant scrap piles (slash piles) into biochar. This is truly high-tech stuff. Read the whole article here. Over at permacultureglobal.com, Daniel Brookmann submitted a series of photos and a description of his biochar project. He has an excess of tree limbs from his orchard and decided to create biochar from them. Check out the photos here. YouthTrade, Conscious Capitalism, & Biochar: Oh My! In case you missed it, here’s a link of the blog post about YouthTrade from this week from Lopa. Give the article a read and don’t forget to share it with your friends! This week, slate.com ran an interesting article on the series of interviews they’ve had over the years. One in particular mentions using boichar to grill food. Interesting angle. Check out the article here. YouthTrade, Conscious Capitalism, & Biochar: Oh, My! I’m just on the plane back from Boston after a whirlwind week brimming with inspiration at the YouthTrade Launch and Conscious Capitalism conference. What are these things, you ask…? 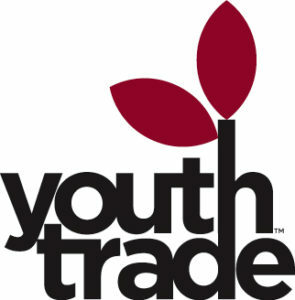 YouthTrade is a new labeling system (think Organic, or Fair Trade) that is designed to give conscious young capitalists increased access to markets. “Youth”, here, is broadly defined (IMO) as “under 35”, so I still fall under that definition of youth (at my ripe old age of 29. Personal side note, I have actually reached a place where I’m happy to be my own age. I don’t want to be older, and I don’t want to be younger, though I’m still happy to be getting older, I’m also not trying to hide how young I am, like I used to find myself doing). YouthTrade. Products by young people. Hope for the future of America. Inspired by, and in partnership with, Conscious Capitalism—meaning it goes beyond organic: it’s socially ethical, it considers whole systems, the companies care for their people and bring the ideas of love and caring into the very fabric of their business. It’s a bit sad to me that this is actually kind of revolutionary. Are you with me here? 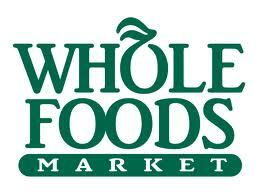 YouthTrade was launched into the 28 Whole Foods stores of the North Atlantic region, and Soil Reef is proud to carry the YouthTrade label and be the only dirt-philia product in the YouthTrade lineup. We are not a candy bar, we are not a clothing company, we do not recommend you eat or wear our product (but if you do, please take pictures and send them to lopa at the biocharcompany dot com, pretty pretty please). 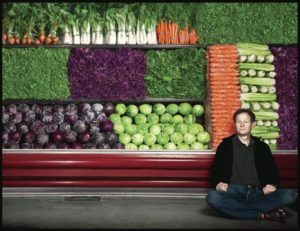 This is John Mackey, and a bunch of pretty vegetables. John did not look quite like this when I met him, but I liked this picture of him best. Veggies make anyone look peaceful. That said, I did get my 5 minutes with John Mackey, and I managed to get biochar on his shirt in that time. I think I will list this amongst my talents in my CV, “Can get biochar on important people, with their consent, in a remarkably short amount of time.” Go ahead, introduce me to someone famous. Watch me. I also received the award for Dirtiest Hands at the Summit for the 2nd time running. I kind of can’t help it, if there’s Soil Reef in front of me, I want to get my hands all up in it. As soon as that bucket opens, my hands are innit. One thing I’ve learned is that if you make up categories of awards to give yourself, you have very little competition. Like right now—at the risk of sounding a little bit egotistical—I am the Most Wonderful Woman Sitting in Seat 10E on United Flight 339. See? That is awesome. Go ahead, award yourself for something only you can do right now. And stay tuned for more goodness on Soil Reef, Conscious Capitalism, and Adventures in Biochar. As always, I welcome your comments. Even (especially!) the disagreeable ones.